These envelopes were posted in England on 21st and 22nd Dec 1954 addressed to New York and Vancouver. They were placed aboard B.O.A.C. Boeing Stratocruiser G-ALSA in London and flown to Prestwick where in an attempt to land, the plane crashed and caught fire. 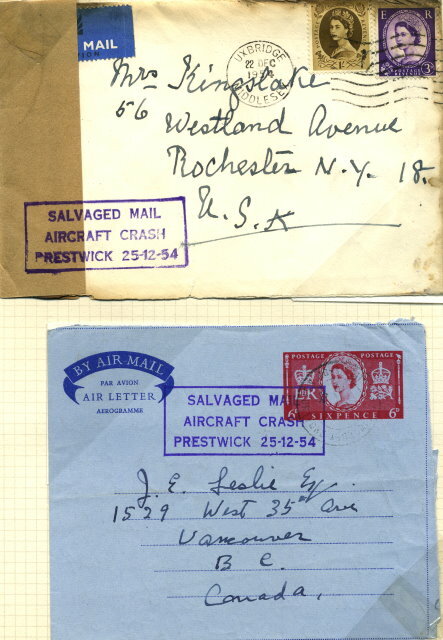 Both covers received the three-line boxed cachet in violet: SALVAGED MAIL / AIRCRAFT CRASH / PRESTWICK 25-12-54.